Following BU’s three-point weekend in Maine, Cason Hohmann, Wade Megan, Matt Nieto and Danny O’Regan (photo) all made the Hockey East top performers list.O'Regan with a dozen goals, is the first Terrier freshman to reach 12 since Colin Wilson did it in 2007-08. Blueliner Ahti Oksanen, whose power play goal tied Friday’s game at 3-3, had his first career multipoint game Saturday with a pair of assists (on both O’Regan goals). He has a 4-7-11 line. Senior Ryan Santana also had his first career multipoint game and earned praise for his work screening Maine's goalie on power plays. After a lengthy drought, there’s renewed life in BU’s power play. With three man-advantage goals in the Maine series, the Terriers have 10 goals in their last 44 chances (22.7%). Despite the successful weekend, the Terriers dropped to #15 in the USCHO poll. They remained at #13 in the USA Today/USA Hockey Magazine poll. As regular season play enters its final three weeks, the standings show that six teams are separated by five points. Merrimack leads BC by one, New Hampshire by two and BU and Providence by three; however, BU has a game in hand on those other four teams. The Terriers’ next opponent, UMass Lowell, is two points behind BU and also has a game in hand against those four. After the Lowell series this weekend, BU has a rescheduled game with Merrimack (Feb. 26), two home games against Vermont and a home-and-home with Northeastern. 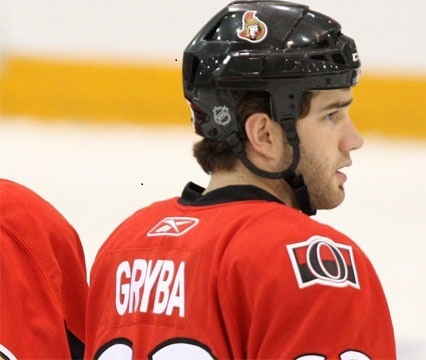 Former Terrier Eric Gryba made his NHL debut Saturday night in Ottawa’s 3-0 loss to Toronto. The Saskatoon native was recalled Friday from AHL Binghamton where he had a 5-6-11 line in 38 games and a league-best +28 rating, which helped earn him a spot in the AHL All-Star game. Gyba logged more than 20 minutes of ice time today in the Senators’ 2-1 shootout win against New Jersey. He was Ottawa’s 3rd round draft pick in 2006 and Binghamton’s rookie of the year in 2009-10. Tomorrow, Ottawa plays the New York Islanders and, if in the line-up, he’ll be skating--for the first time on the NHL level--against his BU roommate Brian Strait, who after being acquired by New York, has cemented a spot on the Isles’ blueline. With Gryba’s appearance, five of the six regular defensemen on BU’s 2008-09 NCAA championship team, have played in the NHL and four are in the NHL today. The others are Kevin Shattenkirk (St. Louis), Matt Gilroy (NY Rangers) and Strait. Colby Cohen, who played three games for Colorado in 2010-11, is in the Bruins’ minor league system, as is the sixth member of the 2008-09 defense corps, David Warsofsky. Three other ex-Terrier defenseman are playing in the NHL, Ryan Whitney (Edmonton), Tom Poti (Washington) and Adrian Aucoin (Columbus). 2013 recruit Brendan Collier scored the tying goal and assisted on the game winner in the EJHL Valley Jr. Warriors 7-3 win against Portland. The left wing, who also added a second assist, has a 5-4-9 line in his past six games and 39 points overall in 41 games. 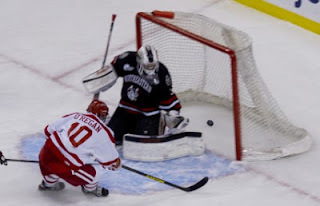 2013 recruit Robbie Baillergeon, who scored a pair of goals and added an assist when Omaha doubled up Lincoln in an outdoor game in Omaha a week ago, talked with Hockeysfuture.com about the Lancers-Stars Lincoln rivalry. #3 Terriers completed a weekend sweep of Vermont with a 3-2 win at Walter Brown Arena, led by senior Isabel Menard’s pair of second period goals. Junior Louise Warren scored BU’s first goal and sophomore Kayla Tutino assisted on all three tallies. BU, which is tied for first place in Hockey East with BC with three regular season games remaining, next plays its rescheduled game with New Hampshire on Wednesday. Terriers have now reached the 20-win mark for a third consecutive season.